Do you have questions about the Bemidji Area Chamber of Commerce? Below, you'll find answers to our most asked questions, but if we do not answer your questions, please call us at 800-458-2223 or email chamber@bemidji.org. A Chamber of Commerce is a not-for-profit, membership-based organization dedicated to protect and improve the business climate and quality of life within a specific region. When was the Bemidji Area Chamber of Commerce founded? The Chamber was first established in 1907. Chamber members are professionals drawn from businesses, industry, education, government, churches and civic organizations, as well as, individuals and retirees. There is a place in the Chamber for anyone who seeks to build a stronger community. What are the benefits of joining the Bemidji Area Chamber of Commerce? To support the organization working on your behalf to increase business and create job growth in the Bemidji Area. To expand your business by participating in Chamber programs and networking with other businesses and to have a voice in the development of the community and its direction. Being a member also gives you the opportunity to give back to the community and enables your business to thrive. Yes, the Chamber accepts MasterCard and Visa for payment of membership dues, publications, marketing services and all events. What is the basis for the Chamber’s annual dues structure? Membership dues are based on the number of full time equivalent employees supported by the company. There are different dues categories for various industries. Call 218-444-3541 ext. 109 or email chamber@bemidji.org for more information. Yes, everyone in your organization is welcome to attend, either in your place or with you. In fact, many of our seminars and workshops are aimed at employees. Event information can be found on our website bemidji.org. How can I stay up to date on news and events from the Chamber? So many ways! We send a monthly newsletter, weekly eblasts and are always posting on our Social Media pages: Facebook, Instagram, Twitter and LinkedIn. 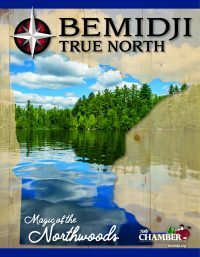 The Bemidji Area Chamber of Commerce is located Downtown Bemidji adjacent to the waterfront of Lake Bemidji and neighboring Bemidji’s famous residents, Paul Bunyan and Babe the Blue Ox. The best way would be to search our online member directory. You may also call the Chamber at 218-444-3541. Please reach out to us at 218-444-3541 or email chamber@bemidji.org.